A Spanish onion is an onion that is larger, and usually sweeter, than traditional white onions. Spanish onions come in 3 colors. Yellow, white and red. They are roundish in appearance and on average the size of a tennis ball to the size of a softball. Choosing: Onions should be firm and heavy. Avoid onions that have sprouted or that have an odor, green or moldy blemishes or soft spots. Buying: The Spanish onion is the variety that is most often found in the grocery stores. 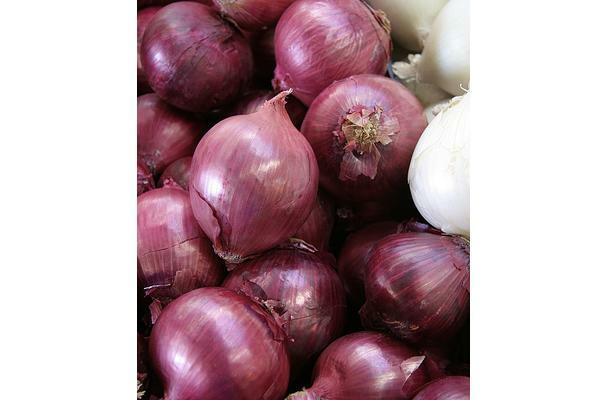 Procuring: Onions are grown from seed or very commonly from "sets". Onion sets are produced by sowing seed very thickly one year, resulting in stunted plants which produce very small bulbs. These bulbs are then set out and grown into mature bulbs the following year, but they have the reputation of producing a less durable bulb than onions grown directly from seed and thinned. It is the largest, most popular onion for slicing and eating raw because of its mild sweet taste. They can also be baked, sautéed, or fried and they store well. Cleaning: Rinse the onion under cool water and peel back the paper like outer peel. Trim the top and bottom and the onion is ready for use. Onions can last for several weeks (if not months) without compromising their taste or nutritional value. However, you must be sure to store them in a cool, dry, well-ventilated place. Onions stay fresh longer if kept in loosely woven bags (canvas works perfectly) to promote air circulation.